This year we offer a VIDEO PERFORMANCE of the event held in 2013 in Amsterdam. 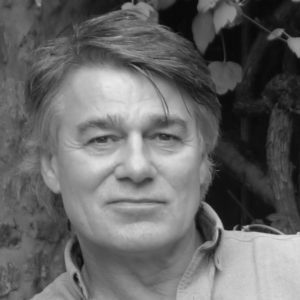 David Whyte, speaker, poet, philosopher, offers a rich blend of stories and poetry that stirs many around the planet to engage in more courageous conversations. Courage: is a word that tempts us to think outwardly, to run bravely against opposing fire, to do something under besieging circumstance, and perhaps, above all, to be seen to do it in public, to show courage; to be celebrated in story, rewarded with medals, given the accolade, but a look at its linguistic origins is to look in a more interior direction and toward its original template, the old Norman French, Coeur, or heart. Courage is the measure of our heartfelt participation with life, with another, with a community, a work; a future. To be courageous is not necessarily to go anywhere or do anything except to make conscious those things we already feel deeply and then to live through the unending vulnerabilities of those consequences. To be courageous is to seat our feelings deeply in the body and in the world: to live up to and into the necessities of relationships that often already exist, with things we find we already care deeply about: with a person, a professional future, a possibility in society, or with an unknown that begs us on and always has begged us on. To be courageous is to stay close to the way we are made. Much is said in today’s world about “just being.” But human beings have never had the luxury of choosing between an untouched and interior foundational self and the necessities and often overwhelming vulnerabilities of achievement in the outer world. We are conversational creatures who shape a real identity only at the edge between the self and the world, between the here and the there, between how we need to be and what we need to be, and especially between the ground beneath our feet and the far horizon to which we go. Through the revelations of poetry and the poetic tradition David will guide us to look into some of the bold, sometimes courageous, always robustly vulnerable and sometimes painful steps in bringing our seemingly interior states out into the world, to be and to do, to achieve and above all to give.